It has dawned on me that although this may be the seventh actual week of MLS play, it really is game week 9. As thus, I'm renaming the statistics series of posts "game week" instead of "week." With that aside, I'd like to provide another important caveat: although Philadelphia looks to have lost in the attendance difference from 2010, the reality is different. Initially, the Union played a couple of games at Lincoln Financial Field (home of the Eagles). Those games were over 30,000 and 20,000, far more than the 18500 seats available at PPL Park. Their average right now is ~17,000, very close to last year's when you factor out the games at the football stadium. We are likely to see the same process (although opposite effect) when Sporting Kansas City starts playing at Livestrong Field, which has twice as much space as Community America Ballpark. Okay, back to the stats. Columbus and New England continue to struggle whilst Dallas is the biggest winner (aside from the Galaxy). Indeed, Dallas had a sellout, albeit very wet, outing against the Galaxy. Even better, the crowds were payed back through a clutch win versus the West Coast giants. No need to get too worried about the New York, Houston and Chicago markets, as they are likely to stabilize and remain close to last year's numbers. 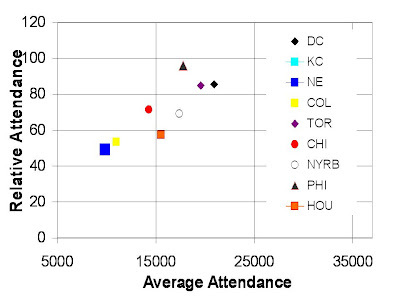 As promised, above is a plot showing the relationship between relative attendance and actual average attendance for teams in the Eastern Conference. 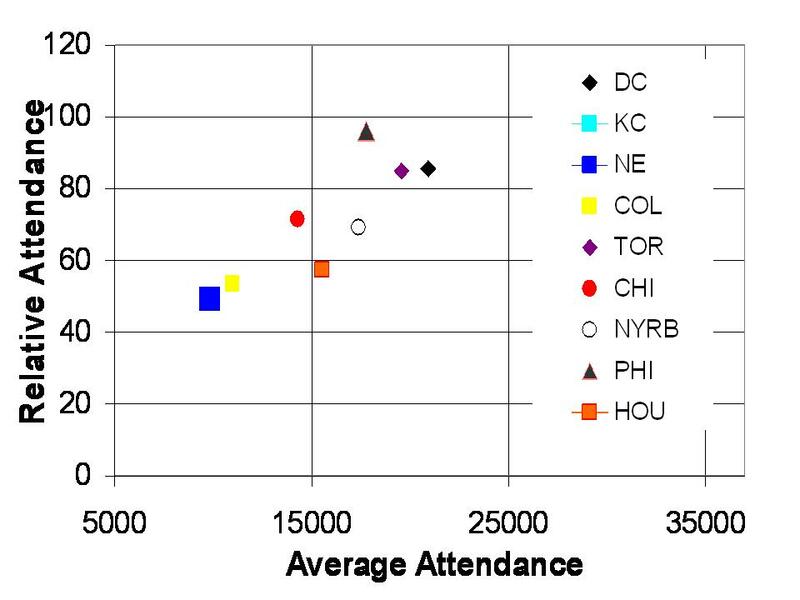 Notice that Philly has attendance near the 100% relative mark but is smaller next to DCU and Toronto given those teams' larger capacity stadiums. Columbus and New England are at the other end of the spectrum. Both are well below the other teams both in average attendance and relative. As far as actual numbers, New England is presently half full (49%) whilst Columbus is slightly higher than that (54%). The US Gold Cup team: Missed opportunities?